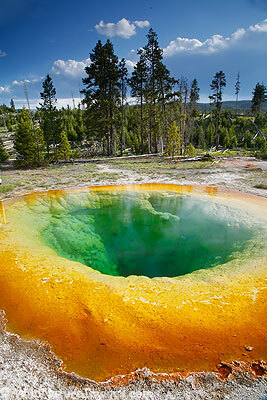 Morning Glory Pool has to be one of the most colorful features in Yellowstone National Park, Wyoming. It is a nice easy mile walk down a paved trail from Old Faithful. so that’s what this is called. I have a photo or two of this, (not very good ones) but never knew what it was called. Man, do I feel stupid. I just asked yoau question via email (NSN) and I could’ve answered it myself, right here. Great photo bruh, as always. You know just last night she said she was going to write something – but I think she just wanted to vent about visitors – If she is like me, she will write it, feel better and never post it :). Dide you use a grad filter on this? The top of the pine trees look dark. Yep, a two stop. I could probably lighten those trees a bit. For the blog I don’t do hardly any PS work, I don’t even remove dust spots – I just post more or less as is. When I finally work this image, maybe I can brighten those tress, although most people would hardly notice. You know I probably didn’t need one – I shot it both ways and preferred the photos with the GND. I often prefer photos where I used a GND for some reason.